I am a high school science teacher in Austin, Texas and have been fascinated by space travel since I first watched Alan Shepherd launch on his flight of Freedom 7 as a 6 year old. I vividly remember the journeys of the Apollo Program and have been a serious student of space exploration history and science for a long time. I strive to pass my fascination with astronomy and space travel to my students. 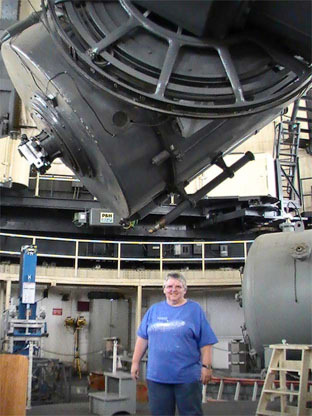 The photo shows me underneath the 2.1 meter (82-inch) telescope at McDonald Observatory near Ft. Davis, Texas. The Observatory is owned by the University of Texas and offers numerous professional development seminars for teachers every summer.